"A very competent and professional service. The crew were always polite, courteous and thorough in their work. They were always on the job early and every day. The final product was as promised and expected. I would recommend them to anyone and have already done so." "All personnel were smart, courteous and hard working. From appointments to meet and deadlines to complete all were on time. Contacts by phone, text and email were responded to quickly. Costings and a programme of work were detailed and we were kept up to date as the job progressed. A member of staff contacted us regularly as the job progressed to ensure we were happy with how the job was going and if we had any requests or queries. All trades involved worked tirelessly and tidily, we were very impressed with how the site was protected and cleaned up after each day. For value for money and the standard of workmanship I would highly recommend this trader. In fact we have already engaged them in another job." 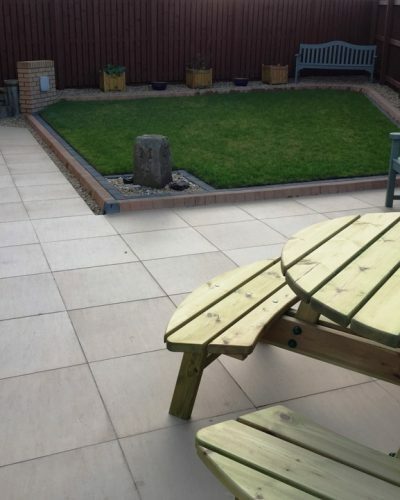 "Would happily recommend Landscape Brothers & would certainly use them again. They completed a redesign and overhaul of our tired rear garden into one that is a showpiece and has cheered us up no end. They are very professional, hard working and a pleasure to deal with. Any problem was quickly resolved. They are a trader that you can trust." "The team who carried out the work in our garden were all friendly hard working and absolutely meticulous in the way they carried out the work. They arrived punctually each day and carried out the work exactly to my specifications and within the agreed timeframe. I cannot praise them enough." "What a service! Quick, efficient, and hard working. I was very impressed." "I have no hesitation in recommending this company. Customer service second to none. My garden has been transformed." "What a service. People who do what they say they are going to do, and at a fair price. I'd never hesitate to use these guys again or recommend them to anyone else ... and I'm the original grumpy old man." "Very efficient service. I will definitely recommend them. I am very glad I came across their website. After being let down by other companies, it was refreshing to find a company that is reliable." "I have just started to use this garden maintenance service and so far have been very impressed. Arrive on time and work hard to a very high standard." "I can`t recommend this excellent service enough. Despite frustrations with weather (persistent rain) these guys have maintained a positive and supportive attitude. Utterly trustworthy and professional." "Very polite, professional and hard working. I would have no hesitation in recommending this team to anyone with a garden problem. Husband and I are delighted with the result"
"When Simon visited to quote for the work he was very thorough and honest about the level of work required and whether or not we needed a full maintenance package. The proposal for initial tidy up work was detailed and gave a breakdown of ongoing maintenance with proposed level of service.The quote arrived very quickly.The initial hedge work was down very efficiently and tidily.The regular team who come once a week are incredibly hard working - whatever the weather, courteous and helpful. Although a programme is in place they are very flexible and always ask if there are any specific jobs I would like done. They also work on their own initiative and the week I was on holiday when they came it was a joy to arrive home to the garden looking so tidy. Great team." "Very impressed with the work carried out by Simon and Arthur. Always very professional and polite. The work was carried out to the highest standard and I was kept informed of progress throughout. I would definitely recommend them to friends or family." "We asked Arthur and Simon to replace a driveway fence and gate that had blown down in the storms. We have used them for gardening before and have been very satisfied with the work done there so thought we'd try them for the fencing replacement too. We're very happy with the result and this one certainly won't get blown down, its solid as a rock and looks like it would stand a hurricane." "I found Arthur and Simon on the internet and liked the look of their website so called them up to get a quote with very good pictures and plans. They were punctual and the quote seemed very reasonable so we arrange a date for them to start the work. They were extremely efficient, calling me to discuss any problems or changes as the job progressed. They finished the work on time and did a fantastic job. Arthur and Simon - Many thanks for a fantastic professional job - your team is excellent." "My first use of this company. I am very satisfied with the work done removing a large ivy that had damaged a garden wall in the gales. Prompt, polite and reasonably priced. Very pleased, I'll undoubtedly use them again." 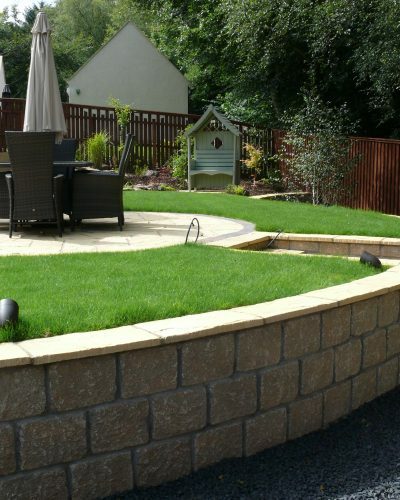 "I was recommended Arthur & Simon by a friend who had some work carried out on her garden. I was impressed with the work they had carried out and wanted a recommendation before proceeding with my own project. They were very professional and despite the terrible weather kept to the agreed timetable and kept me informed when they were unable due to the rain. From concept of idea to completion they were very professional and the workmen very friendly." "I was very pleased with the work that was done - lifting the grass and replacing it with chips and erecting obelisks and planting clematis inside them. I have had some nice comments on how nice it looks all thanks to the work of Arthur and Simon and the people who work for them and they cleaned up behind themselves. Thank you once again." "I had a train crash of a back yard and a jungle of weeds at the front. I engaged A&S to reslab front and back. I can now describe the back yard as a patio and the front is the envy of the street. Everything went to plan, the chaps who did the work went way beyond my expectations in the job they did and the way they went about it. Very obliging and professional. Great to deal with and very highly recommended."